You are currently browsing articles tagged HRDC. The busiest time of year! Reading period on campus is simultaneously a really stressful and really fun time of the year: in addition to the paper writing and studying, there are always a bunch of end-of-the-year events and performances happening around campus. I tend to use these kinds of events as fun bribes for myself to help get through long hours of studying, so I’ve been keeping pretty busy this past week! Since I couldn’t pick just one event to focus on, I wanted to give an overview of my favorite events from reading period! Macbeth – Up first this reading period was some Shakespeare, which I was especially excited to see because two friends of mine were the director and the lead role. 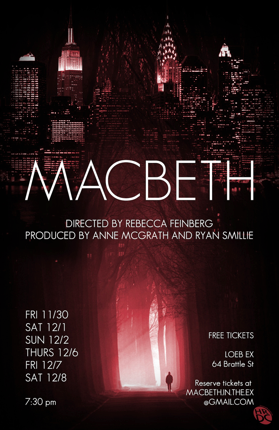 I’d never read or seen Macbeth until this show (maybe I should be embarrassed by that), but the cast (and crew!) did an incredible job telling the story, and with a really cool adaptation – it was set in New York City’s Financial District. It was put on in the “Experimental Theater” at the Loeb, which is a really small theater that allows for creative set design – really cool to see how different shows use the space. Three-House Formal – Each House has a winter formal during reading period, and this year Dunster teamed up with Leverett and Quincy to have a “Three House Formal” downtown Boston. The House Committees, who are groups of undergrads in each House that plan social events, had planned an incredible event at the Seaport Hotel, complete with a live band and photo booth. I coincidentally have a bunch of friends in Quincy and Dunster, so it was awesome to have an opportunity to hang out with them all! 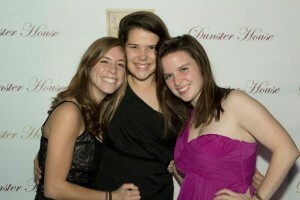 Plus, it’s always fun to get dressed up once in a while. 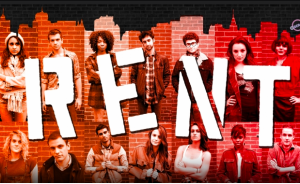 RENT – The Harvard-Radcliffe Dramatic Club put on RENT this weekend, and while I’m a bit biased (RENT is probably my favorite musical) I thought it was the best production I’ve seen at Harvard so far. I again had several friends playing lead roles, which made it even more fun to watch, but it was also crazy to see younger actors nailing some of the biggest parts. So much talent! 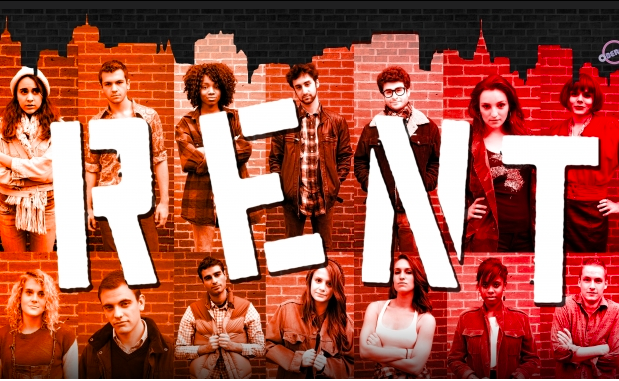 RENT was at the Oberon, which is more like a nightclub than a formal theater, and the action happens all around the room, which made the experience even more exciting. 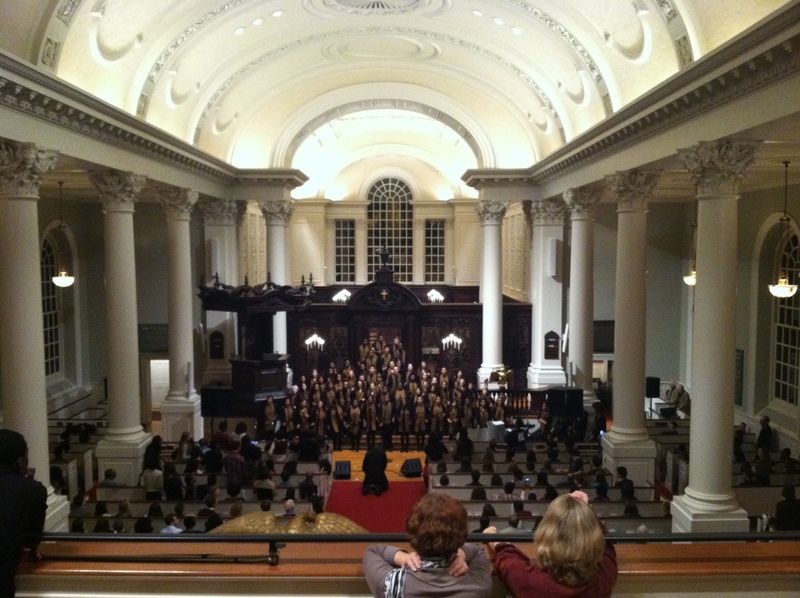 Kuumba Christmas Concert – Kuumba is Harvard’s gospel choir that celebrates African American tradition and culture (“Kuumba” means “creativity” in Swahili), and this weekend was their annual Christmas Concert. This is the third time I’ve attended this concert and it’s always SO impressive – the group brings amazing talent and energy and it’s a really joyful experience for everyone involved. It’s also no small feat that they manage to fill up Memorial Church twice in one weekend – that’s close to 1000 people! Gift Exchanges – Less formal events this week have included gift exchanges with a few groups I’m a part of on campus, and I just came back from a “Secret Stalactite” event with the First-Year Outdoor Program. As far as reading period goes, I have a pretty manageable schedule this year, largely because I’m only taking three classes, one of which is my thesis. I turned in a final paper for my History of Art class on Friday, have a fifteen-page take-home exam due this coming Wednesday, and an exam on the 17th. Almost done with the semester! Now, back to work! After the joy of Thanksgiving break (which was MUCH needed – so nice to be home!) I was unlucky enough to come back to school to an extremely large pile of work and a big ol’ presentation for my Social Studies tutorial. Not so fun! So needless to say, I’ve spent the week cracking down on my assignments, drinking lots of coffee, and spending late nights at the library. I did have one near-horror story with my paper, though. For background: in order to print using library printers, students have to swipe their ID and pay with “Crimson Cash,” which you can load onto your card online. The paper I was writing was for American Constitutional Law, and given that our professor is a Law School professor, we needed to submit our essays in hard copy at his office at 4:30. I was working on my paper down to the wire, went to print at 4:15… and discovered I didn’t have enough Crimson Cash to print it! Probably the most stressful 7 minutes of my semester were spent trying to load money onto my account, waiting for it to load, and finally printing my paper. A full out sprint across Harvard Yard later, I submitted at 4:27 – phew! Yesterday also marked the end of classes, which means that today is the start of our nine day reading period. I was joking with friends this morning at this day (that is, the first day of reading period) is the “best day of the year” – mostly because it’s one of the few times all semester you can feel guilt free when you’re not working. I took full advantage of my mini-break and treated myself to dinner out last night and a long night’s sleep. It was much needed! The bliss only lasts for so long, though, as end of the year assignments and activities begin cropping up constantly during reading period. I have two more papers due over the course of the next week, as well as three exams during our finals period, which means I’ll definitely be working! Outside of class, though, there are also a lot of fun social events and activities going on, which means students are usually busy all day despite not having classes this week. Tomorrow night, for example, is the “Five House Formal” – as you might have guessed, five of the upperclassmen Houses are joining together to run a giant formal downtown Boston. As further evidence of how hectic reading period can be, there are probably a dozen end-of-semester performances going on this weekend. I went to see my friends in Spring Awakening and Little Shop of Horrors Thursday and Friday, and am going to the Kuumba (gospel) concert tonight. It’s definitely busy trying to balance everything! The mix of school and fun is what makes reading period great, though – I’m strangely looking forward to the next week! Current students are the Admissions Office’s greatest resource. They can give you a first hand account of the life of a Harvard Undergraduate. Although these students blog at the request of the Harvard Admissions Office, they are not members of the Admissions Committee and therefore are unable to answer questions regarding admissions. Please use the links below to visit the Admissions website. Harvard reserves the right, at its sole discretion, to screen and remove any content it deems inappropriate. This includes commercial content whose primary purpose is to sell a product, a service, or other such practices via this blog, as well as content that harasses, abuses, threatens, or in any other way violates the rights of others. Although it may screen and remove content, Harvard is not responsible for the content posted by others on the blog pages. We also reserve the right to remove posts containing any and all links.